Robot palletisers are becoming increasingly important in the corrugated cardboard industry to be able to produce efficiently. Our palletisers are very precise when palletising the most complicated packaging in all types of desired patterns. 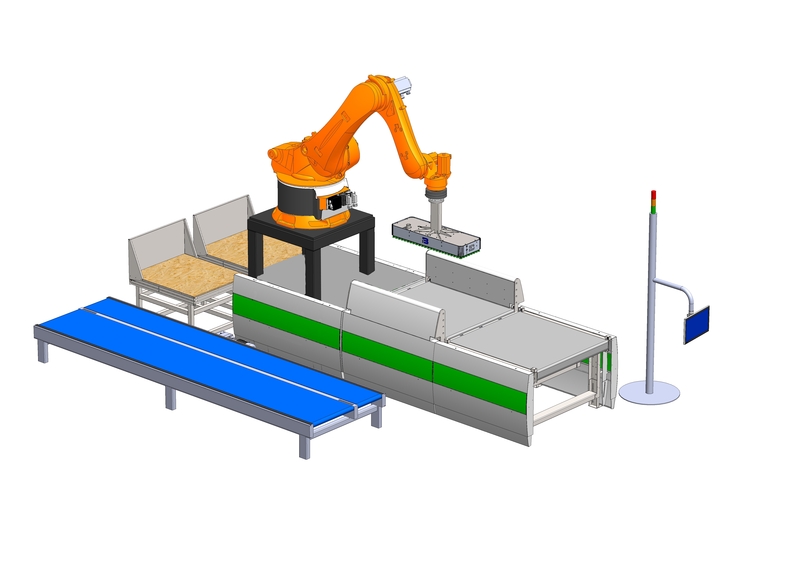 A major advantage of the robot palletiser is the compact setup, which makes it a flexible option for integration into (existing) production lines. When developing our own Van den Bos-cm machines we use very stable frames and high-quality components from companies such as Festo, Igus, Leuze, Forbo, Schmalz, Nord and KUKA robot. The software requirements of Van den Bos-cm are definitely raising the bar. Would it not be great if a palletiser has a software interface with the main software system, meaning that the setting is automatic and the palletiser palletises the pallet itself as efficiently as possible? Intelligent and intuitive software with a strong visualisation are hereby essential. This is reflected in a very large industrial Multi-Touch panel on which the machine is displayed in 3D, the package flow can be visually checked in real-time and, in the event of an error message, it is shown per section how the problem can be resolved. We also like to please the eye. The time that machines were purely functional has passed. Our high-quality machines also have an attractive industrial design. At Van den Bos-cm we focus on your requirements and use our initiative to optimise these with the latest developments. Following installation and commissioning, we offer a good and fast service where the main concern is that the production is interrupted as little and as short as possible. Below you will find our range of transport systems in different categories.